Home→Book Rec→Win a trip to outer space! Win a trip to outer space! Want a chance to win a copy of the book and join Trix on her journey? Just comment on this post mentioning your email address and your favorite SF book for kids or teens. I’ll pick the winner on Circus Galacticus‘s release date, next Tuesday! Hi Megan and Deva! 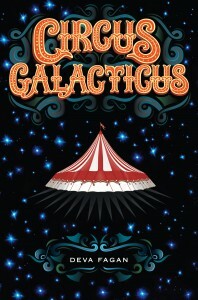 I’m dying to read Circus Galacticus, so I hope I win! My favorite SF book for teens is Feed by MT Anderson. I first heard about Circus Galacticus from author Cindy Pon. I do really love dystopian fiction, but I would LOVE to see more YA science fiction. I really enjoyed Feed as well. MT Anderson has a great style to his writing that I endure. He is the prefect example of assuming your audience is intelligent rather than talking down to or dumbing things down. As far as a favorite science fiction book there is no way I could stick with just one. AND my preference is for dystopian fiction, but I am going to stay away from that because I want to focus on non dystopian YA/MG sci fi I have really enjoyed. The first is Singing the Dogstar Blues by Alison Goodman. When I first started trying to read more science fiction, this was on all the lists. The title didn’t really appeal to me. I put off reading it for a long time, but it has a really great story and wove musical elements throughout, which I found interesting. My next choice is Tria and the Great Star Rescue by Rebecca Kraft Rector. This story appealed to me because it was pure fun. It was like a game a make believe that a young child would play and I think the imaginative qualities would appeal to young readers. My third and final choice (before I high jack this whole post, or have I already?) is Academy 7 by Anne Osterlund. This would appeal to older readers and has some romantic elements. I can’t pin down exactly what I loved about this book, maybe it’s lack of overt dystopianism, but I remember being surprised with how much I enjoyed it. Thanks so much for having this giveaway. Up until this post I had never even seen the cover to Circus Galacticus and now I am even more excited to read it. My favourite SF book is The Graveyard Book by Neil Gaiman. I love Ender’s Game – Orson Scott Card.